From the outside it might seem like relatively minor stuff - scuffles and anger in South Africa's parliament, and defections and splits within a trades union federation. But make no mistake - these are crucial, perhaps even momentous, times for South African politics. A status quo that has survived for 20 years of democracy is finally beginning to crack. There is a chance this could be a good thing for South Africa - that a clumsy consensus that served the country well in the years after apartheid is no longer fit for purpose, and that a more nuanced, contested form of democracy may now take over. But the governing African National Congress (ANC) does not see it like that, warning loudly that "fascists" and "racists" are threatening the survival of the institutions that have kept this country stable since 1994. Much now depends on the way the ANC - after two decades of unchallenged power - deals with a more robust opposition in parliament, the erosion of a key political alliance with the trade union movement, and the dawning possibility that it may soon lose power in two of South Africa's nine provinces - and one day at a national level too. Thursday's fighting in parliament can be traced directly to two immediate factors - one is the recent influx of MPs from the Economic Freedom Fighters (EFF) party. They are unapologetically rowdy and populist, and have energised - not always in a constructive way - an institution that many South Africans, numbed by the ANC's overwhelming majority, had apparently stopped caring about. The second factor is called Nkandla - the scandal about the lavish tax-payer-funded renovations to President Jacob Zuma's private home that will not disappear. Although many senior ANC figures have privately expressed deep unease about the issue, the party has publically rallied around the president in strident fashion. The last straw - well, one of many - came in the shape of an ad-hoc parliamentary committee that exonerated Mr Zuma of any personal wrongdoing, after opposition members had left it in frustration. The ANC then used its majority to adopt the committee's report on Thursday. South Africa's opposition is usually divided in parliament - and outside - to the advantage of the ANC. But Nkandla has seen political rivals united against the governing party with unusual vigour and co-ordination. It could be a sign of things to come - an opposition coalition one day strong enough to challenge the ANC's majority. All of which helps explain why the current chaos in South Africa's trade union movement is also giving the ANC real cause for concern. The Congress of South African Trade Unions (Cosatu) has been in a strategic tri-partite alliance with the ANC and Communist Party - an arrangement that helped keep stability and achieve some progress in the labour market for decades. But a combination of factors - including falling membership, political rivalries, and incidents like the Marikana mine killings of 2012 - have led to a deep split, with the biggest trade union, the National Union of Metalworkers of South Africa (Numsa), now expelled from Cosatu. A more competitive, vibrant trade union movement - decoupled from its leaders' increasingly cosy pact with government - may not necessarily be a bad thing for South Africa, at a time when the economy is struggling and business, government and labour urgently need to re-evaluate their relationships. But again, the ANC is unlikely to react enthusiastically. It has only to glance north, towards Zimbabwe, to see the potential challenge that a well-organised, union-based party can offer to a seemingly robust liberation movement. Zimbabwe's Movement for Democratic Change (MDC) has not ultimately triumphed in the way many predicted, but that may have as much to do with rigged elections and violence as with its own internal flaws. The likelihood of a new trade union party sweeping to power in South Africa is vastly overstated. This country already has a crowded opposition scene. 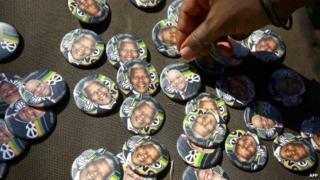 But it would certainly take more votes away from the ANC and push the governing party closer towards electoral defeat. In other words, these are increasingly challenging times for South Africa's ANC. Will it tackle corruption, improve service delivery, harness its prodigious talents, and earn the right to many more years in power? Or will it scream "fascists" at every new challenge, ignore court orders, and - as some already fear - start to chip away at the impartiality of the independent electoral system that has served this democracy so well?